As I mentioned before, these weekly photo themes often put a song in my head. This week’s song is Reflections, a Burt Bacharach song from the 1973 movie Lost Horizon, which I’ve never seen. That movie was a remake of Frank Capra’s 1937 film of the same name, also which I’ve never seen. Both movies were based on a novel by James Hilton. Which I’ve never read. But I know the song. Note for note. Word for word. And this is because I heard it about five million times (I’m exaggerating only slightly) when I was about 10 or 11 years old. And this is because my parents chose to use the song as background music for a slide show they were producing for a client. Some of you may remember the days before desktop computers, before pocket video cameras, before Powerpoint. Back then, if you wanted to make a presentation to share with your company or clients, you could make flip charts on paper, or draw on a black board (white boards also didn’t exist). If you had a bigger budget, you could hire someone to make a film that you would display with a whirring film projector on a pull-down or pop-up screen in the conference room. Or, you could take photographs of your subject matter, develop them on slide film, arrange the slides in a carousel slide projector, record a narrator on a reel-to-reel tape recorder, record background music on another track of the same tape, and then synchronize the narration/music sound track with the slides. The entire process is a lot of work. It takes awhile, and it’s quite manual. As kids, my sister and I didn’t see a lot of the work that went into these slide shows (and there were many), but the one part we were submerged in was that final sequencing/synchronizing where my parents would spend hours and hours every evening making sure the slides were in the right order and that the next slide was shown at exactly the right pause in the narration and the right beat in the music. Tape player on. Click. Advance slide. Click. Advance slide. Click. Stop recorder. Rewind. Play. Click. Click. Stop. Rewind. Play. Click. Click. Click. Click. Stop. Rewind. Play. A painstaking process. Whereby you learn every. single. note. Which reminds me of the hours that we would spend trying to figure out the lyrics of a song by playing a tiny portion of the song on the record player, lifting the needle, writing the lyrics we thought we heard down, starting the song from the beginning to verify what we heard, then moving on to the next line and the next. Hours spent with our heads down, as close to the speakers as possible, grateful for clear enunciators, cursing Elton John for his slurry diction. All of which has nothing whatsoever to do with the photograph at the top of this post. Unless you take it as a metaphor: standing on a present-day city street, wrapped in a puffy winter coat, nose pressed against the shopfront window, the contrast of inside and outside, past and present, and the layers of reflection that dance between them. 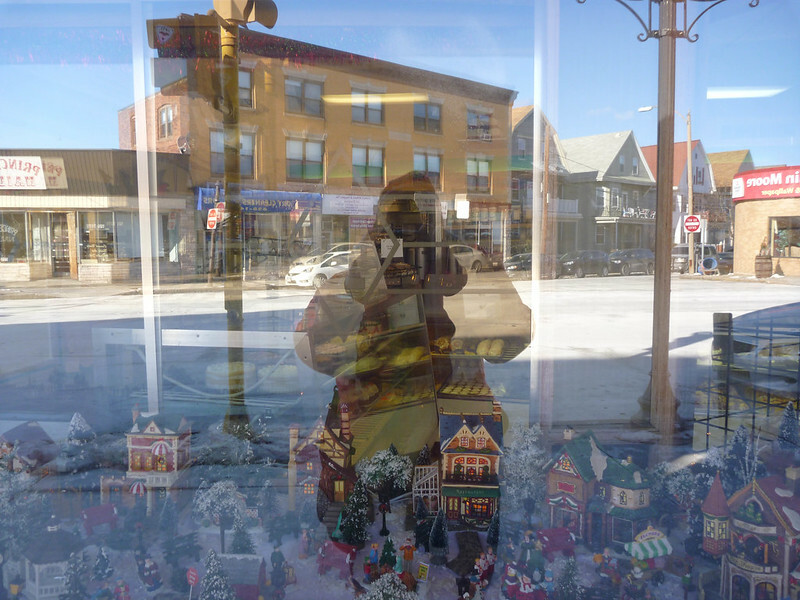 I love that your reflection is in the bakery store window. I also can appreciate what you were talking about with the carousel and the slide projector — boy did that bring back memories! You have outdone yourself! I love it! Oh, thank you so much, Tammy!